Monday April 2 2018 Stawell, VIC: Two 21-year-olds today claimed the crowns at the Stawell Gift, Australia’s richest footrace. 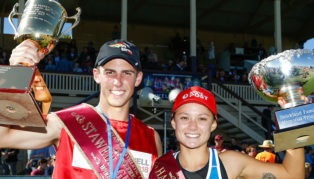 Jacob Despard, a Tasmanian who moved to Victoria in November, won the Stawell Athletic Club Stawell Gift, and Queenslander Elizabeth Forsyth won the Australia Post Women’s Gift. Despard went in to the final as the favourite, having the fastest time in the heats on Saturday of 12.214, 12.236 in his semi to hold off US hurdler Devon Allen and eventually taking out the final in a time of 12.121. Hamish Adams was second on 12.212 and third was Gary Finegan on 12.295. Reigning champion Matt Rizzo was fourth. Forsyth, who is more used to running on sand than grass, stormed home to win the Australia Post Women’s Gift in a time of 13.685. Second was Pam Austin with a time of 13.964 and third was Stephanie Jinks on 13.971, fresh from her victory in yesterday’s Telstra Store Ararat Women’s Handicap 70m. Elizabeth is a sports science student at Griffith University and supports herself with part time jobs at IGA and the local newsagent in Miami where she lives. This is her second trip to Stawell, after competing last year. Jacob Despard has been trained by Scott Rowsell since he moved to Lalor in Melbourne less than six months ago. “I just moved out of home and that’s a big expense, I’ll save some but I love cars, so I might put a bit of money into my car. This is the 6th time I’ve been to Stawell. I was originally in the team when Andrew Robinson won and that fired me up, then in 2015 I made the semis but lost to Murray Goodwin who went on to win. So, for me, this is a fantastic next step in my athletics career. “I’m going to come back every year. Short term I will fly to the Bunbury Gift in WA next month with some of the Commonwealth Games athletes coming so that will be competitive. Then for the next 12 months I will be really pushing for the Australian team,” said Jacob. In the popular Victorian Government Chris Perry Backmarkers Invitational Handicap 120m Mia Gross, Kendra Hubbard and Sarah Blizzard were pitted against the men, with Devon Allen taking the win in style from Michael Romanin and Mitchell Williams. In his return to Stawell, newly inducted Stawell Athletic Club Legend Josh Ross placed fourth. Meg Deane came home to win the Lorraine Donnan Women’s 400m while the TAC Herb Hedemann Invitation Handicap 1600m was won by Matthew Tonge. Day 3 photo gallery (Part 1) is here. If prompted, enter this password: LHphotos and please credit photos to Luke Hemer.